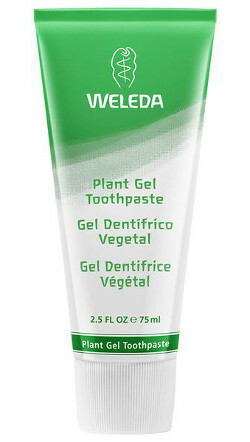 Those with sensitive gums will find Weleda's Plant Gel Toothpaste to provide soothing relief as it gently and effectively cleans the teeth, and the taste is difficult to beat with a combination of lively mint and fresh lemon. Ingredients: Glycerin, Water (Aqua), Hydrated Silica, Chamomile Recrutita (Matricaria)*, Krameria Triandra, Commiphora Myrrha*, Mentha Viridis (Spearmint)*, Mentha Piperita (Peppermint)*, Foeniculum Vulgare (Fennel)*, Algin, Alcohol, Esculin, Limonene. *from natural essential oils.